After traveling across country in a covered wagon, in 1899 Stephan and Charlotte Jones purchased a 221 acre farm near “Caples Landing” in “The Bottoms” here in Woodland, WA. With the help of their sons and the whole family they farmed the land and operated a dairy there. 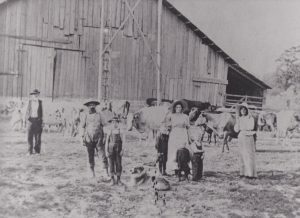 Pauline Jones Buchholz (4th from the left in this historical picture) is quoted as saying “…that there was a high water line in the haymow from the 1883 or 1895 flood, and another water mark inside the first floor of the barn from the 1948 flood.” It is said that Ragna was pregnant with Adeline at the time of this picture. After the sale of the Jones farm, Phillip and Ragna Jones took their share of the stock and on October 11th, 1917 bought a 200 acre parcel “up river” near the intersection of Hansen Road and Old Lewis River Road. There was no house on the property at the time. Adeline Elise Jones was just seventeen months old when her father built a wood floored tent and moved his family in. He built the barn first in 1919 where they continued to dairy and also began logging in the Lewis River Valley. 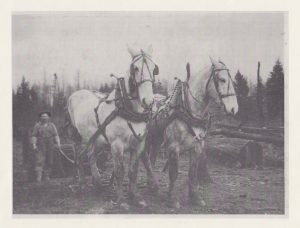 Phillip Jones with two of his horses harvesting timber in the Lewis River Valley. 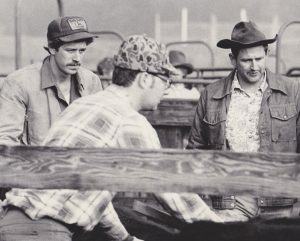 Woodland’s history within the dairy community is quit inpressive. After suffering at the hands of a the local Creamery who had a monopoly on the market, in a bold move in the 1880’s, with the expertise of Peter McIntoch who later went on to help build a world renowned cheese-making enterprise in Tillamock, OR; local citizens organized the Woodland Creamery to provide dairy products for local citizens as well as Portland residents. 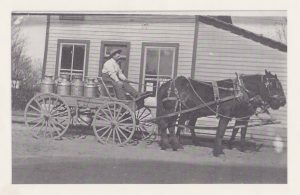 Phillip was very proud of his dairy cows and is pictured here bringing eleven cans of milk to market. In 1920 Phillip built the Farm House for his family. He also built an electric generator into the house. His home was the first house in the Lewis River Valley to have indoor lights and was a gathering place for bible studies as well as other local communal gatherings. On March 10th, 1942 Adeline and her husband, Ben A Thomas bought the farm from Adeline’s parents along with 223 acres for $13,500. Their monthly mortgage payment at the time was $50. Ben Sr and Adeline turned the farm into a beef ranch and Adeline herself had over 100 head of sheep in the old sheep shed. During the flood of 1948 Ben Thomas, Jr (“Tommy”) remembers that “Casey” Smearman had to move his herd to higher ground on the Thomas ranch. Also in 1948 Ben and Adeline were able to repurchase the old Jones homestead at “Caples Landing” to raise beef. It was farmed by Ben and Adeline’s son, Bob until 1997. Adeline E. Thomas as a young adult. 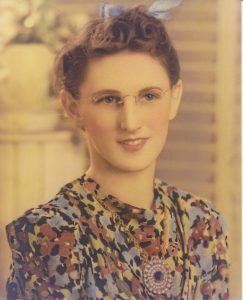 Adeline E. Thomas was a life-long resident of Woodland, WA. Adeline was a member of Longview Community Church, in 1998 was named Woodland’s Co-Citizen of the year along with her husband Ben Thomas, and again in 2006 was named Co-Citizen of the year. Adeline was a woman ahead of her time who worked to help other women. She was the President of the Longview Soroptimist. The Soroptimist is a global volunteer organization that works to improve the lives of women and girls through programs leading to social and economic empowerment. She was a member of the Cowlitz County Cemetery District 1 Cemetery Board, a member of the Woodland School Board as well as a Sunday School teacher to several generations of Woodland residents. Several local residents have shared that Adeline was a hard working, kind hearted, gracious, and lovey woman with whom you did not want to cross. Being married to a tenacious, industrious man who worked tirelessly to achieve his dreams would have required much strength. One of Ben A Thomas, INC’ Washington logging camps. Ben also founded Ben A. Thomas, Inc. 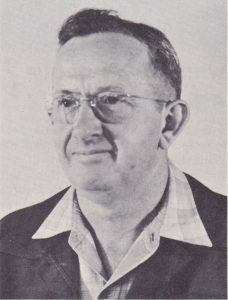 In a 1959 magazine article he was noted as being “a model logger”. At the height of it’s success, Ben A. Thomas, Inc was the world’s largest indipendant logging company! 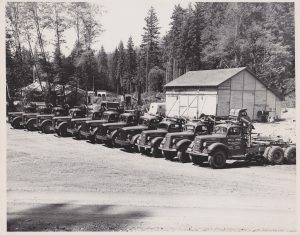 Ben A. Thomas Inc. fleet of logging trucks. 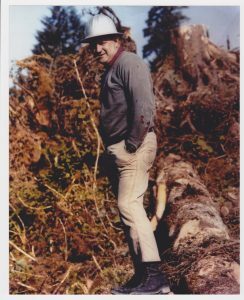 Tommy pictured here at the Danger Bay logging camp in Afognak, Alaska. Benjamin A Thomas Jr. “Tommy” grew up working the family businesses along with several other Thomas children. As a child he worked along side of his Grandpa Phillip who taught him many old farmers’ tricks out in the fields. He helped his parents with farm chores and many farm improvements over the years. 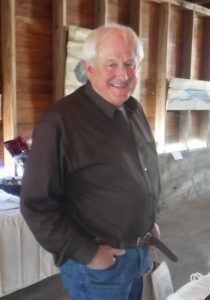 Tommy has also worked the family cattle ranching business and helped manage Adeline’s sheep. 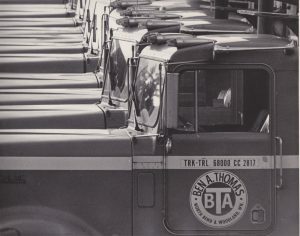 Tommy also was and integral part of Ben A Thomas, Inc. The family logging business was all over the world from Japan to Alaska. Tommy worked with US government officials to help further along their success. As executor of the Adeline E Thomas Estate, Tommy is still working to do the best with his family’ land. Tommy working in the cattle yard. Farms possible! He began by inviting us to sit down at his dinning room table and have a good old fashion talk about what we wanted to do with his family’s farm. He has taken us under his wing. Tommy has been here for broken water pipes, been on hand to explain where and how old farm systems work, he has donated time, farm equipment, and materials, as well as solid advise on many projects, and was there the tragic night of our fire to hold us as we cried. Ben A Thomas Jr gave us an opportunity to create something really special and strive for our American Dream!! Muriel and I have much love, respect, and the deepest gratitude for Tommy and the opportunity he gave us! Thank you Tommy!!! Tommy supporting Adeline Farms at our Fire Relief Benefit.